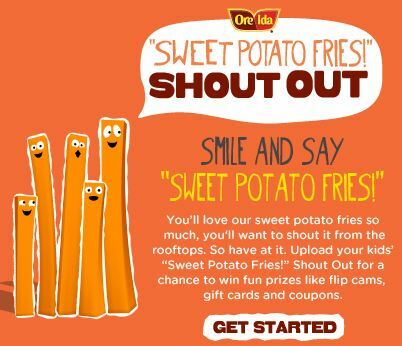 “Sweet Potato Fries!” If your kids can say it, then you have a chance to win a flip video camcorder or one of over 100 other prizes in the Ore-Ida Sweet Potato Fry Shout Out Sweepstakes. In fact, even if your child can’t say “Sweet Potato Fries” and ends up saying something more like “Smeet Table Ties”, that’ll work too. I’ve watched some of the submissions for the contest and from young to older, those kiddos sure like their Ore-Ida Sweet Potato Fries. Also, don’t forget to request your coupon for $1.00 off a bag of Ore-Ida Sweet Potato Fries when you’re visiting the Ore-Ida Facebook page. From now through May 27th, families across America can submit a video no more than 10 seconds in length featuring their kids saying “Sweet Potato Fries” in their own way. All uploaded shout outs will be entered into the sweepstakes once the entrant visits Facebook to “Like” the Ore-Ida page. Entry into the sweepstakes is also valid by mail without having to submit a Shout Out. To learn more visit www.facebook.com/oreidapotatoes or go to www.oreida.com/spfrules to review the official sweepstakes rules. THREE (3) winners will receive a coupon for FREE Ore-Ida Sweet Potato Fries! Leave a shout out to your favorite Ore-Ida product. +1 if you enter the Ore-Ida Sweet Potato Fry Shout Out Sweepstakes. +1 “Like” Ore-Ida on Facebook. Giveaway ends at 11:59 PM EST, May 27, 2011. I’m ALL about the sweet potato fries. Sweet potatoes are my favorite! And I’m a follower of your blog via GFC ! I like their crinkle cut french fries. I use their diced pototoes in casseroles all the time! I like ore-ida on fb. Tatter Tots dipped in a horseradish mayonnaise combo. Yummy! I like the Fast Food Fries. I really enjoy their Onion Ringers. I’ve always loved onion rings! I like the steak fries. I like Ore-Ida on Facebook as Ricky Todd. I like the Steam and Mash potatoes. My favorite Ore-Ida product is Hash Browns. Bagel Bites, and yes they really are made by Ore-Ida! I like the crinkle-cut french fries. I “Like” Ore-Ida on Facebook. I love their Crinkle Cut fries. And tater tots. I have so been wanting to try the Sweet potato fries but I don’t think my family will like them, hubby already said he wouldn’t, and I don’t want to waste money. I would love to win a bag so I can try them. Like Ore Ida on FB. I like their Hash Browns. We love the hash browns. 1 – I follow via email! 2 – I follow via email! I like Ore Ida Steak Fries. Original Ore-Ida Tater Tots! That’s our favorite. Follow you on Twitter @oneinpurpose. I enter the Ore-Ida Sweet Potato Fry Shout Out Sweepstakes. I like the curly fries! We love their steak fries! I love the Golden Crinkles Fries. I like Ore-Ida’s extra crispy fries. I love the Tater Tots! Tater Tots are my familys Tops. I liked ore-ida on fb! Tater Tots make my toes curl! I love you onion rings! I love Ore-Ida Tator Tots!!! YUM! The generic brands cannot compare! We like their fast food fries! i like their steam and mash potatoes! I love the Onion Tater Tots! I love Ore Ida’s extra crispy fries! We love the crinkle cut fries! We like the Ore-Ida Golden Crinkles. I love the tater tots. Let’s hear it for Potatoes O’Brien! Thanks for the giveaway…we like Ore-Ida Steak Fries ! I love their waffle fries.